Below is the transcript from our 1998 Ninemsn world-wide live chat with X-Files stars Gillian Anderson, David Duchovny & writer Chris Carter. I was a member of the team back at NineMSN in Australia who helped run and co-ordinate this live event. NineMsn, MSN Start UK, MSN US, MSNBC and Microsoft Studios, in conjunction with New Weekly in Australia, welcomes X-Files The Movie fans from all over the world to our online chat with X-FILES stars Gillian Anderson, David Duchovny, William B. Davis (The Cigarette-Smoking Man), and John Neville (The Well-Manicured Man), as well as the movie’s producer and writer Chris Carter on the eve of the X-Files’ movie, Fight the Future, release worldwide. This is the transcript of the record-breaking X-Files live chat event where over 21,000 users logged on to chat with the stars of Fight The Future. Given these numbers and the dynamism of the chat environment, some questions and answers read out of sequence. This is the way they appeared in the chat room – so enjoy them! It is 7am in Sydney Australia and 6am in Japan June 12, 1998, and 10pm in the UK, with other countries online as well, 11 June, 1998. Ladies and gentlemen, we give you The X-Files Movie Internet Event! Welcome to FBI Special Agents Fox Mulder aka David Duchovny and Dana Scully, aka Gillian Anderson with X-Files producer and writer Chris Carter on the day the X Files Movie premiered in Los Angeles June 11th. What was the wildest thing that ever happened during filming of the X Files. Chris as the director any anecdotes…? What was it easier for you making a movie instead of a T.V. series? Well, from the beginning we’d always said that our show was like the movies we were seeing in theatres. It had production values of a movie and doing stories that were movie worthy. We’d made this boast to our selves though we’d never gone public with it – we’d always thought the Show was like a movie. So to actually make the movie was kinda like a fulfillment of that boast or promise – that we had been secretly boasting about amongst ourselves about…did I say the word boast enough? :0). Gillian, did you change your acting style at all? <laughs> I know – as David said, we took a big screen approach to our small screen, I know now that was what we imagined we took but everything changes for the big screen because doing a movie is a much bigger venture than doing a TV Show and not just because it costs more, because everything changes – the size of that screen changes the dramatic weight of everything. What will the move from Vancouver to sunny Los Angeles for the darkness in the X Files that we have come to know and love? Chris, do you ever plan on giving Scully a desk? I think that question was answered in an episode we did in the 4th season…she does have her own desk – and a tattoo to go along with it. Yeah…she has a tattoo of a desk! If Fox Mulder discovered that Larry Sanders was an alien clone? Would he have the heart to kill him with an Ice Pick. You know you played Basket ball. Did you seriously consider a career as an athlete? I considered it but nobody else went along on that fantasy with me. I played in basketball in high school a little bit in college. I shot a shot in “Paper Hearts”. I sunk like five out of eight (baskets). He did and he was pretty far back! 3/4 of the way back on the court – I helped him of course. Well, I don’t wanna brag <grin> That other guy Tom Noonan he is a good ball player. How do you account for the X Files’ tremendous popularity? I’ll answer that – It’s David and Gillian – that’s it – period. It’s the characters they play and the way that they play them. Oh, it’s not just…it’s many, many things…scripts, cinematography, the sets, the relationship between Mulder and Scully, the co-stars we get to work with and the casting of them, the topics and the subject matter. We know you as Mulder and Scully rather than Fox and Dana. Why don’t you call each other by your first names? It’s like we use it as a dramatic device. <over last> Yeah, no – Fox – I wasn’t thinking of it that way. It seems like another step towards intimacy. Next season she’s just going to call me Fo… then just ‘F’…. Does the movie have plot threads that lead into the next season of episodes? Gillian Anderson: Do you mean will it?… does it? Yes. The idea was that the movie is a culmination of a lot of what happened in the first five seasons and then the big things that happen in the movie, will lead into season 6 and beyond. Chris, do you have a favourite episode from the X Files series? I have several favourites I choose from different seasons so I’d have to go through seasons 1 through 5. When I think about it. I was in Cost Rica at Christmas time and I watched ‘Beyond the Sea’ in Spanish so I must like it a lot I think! I have favorites, but I feel bad after I talk about them, because it’s like convering your blessing onto some of your children but not your others. There has been a lot of speculation about where Mulder and Scully’s relationship is going. Will the movie answer any of that for us? Ahhhhh…it will suggest some things but I don’t think it answers anything but it will present an interesting situation for Season 6. It certainly has ratcheted it up <grin> to an extent. <laughs> Ratcheted it up? Hey, a bumper sticker! Do you think that Mulder is capable of carrying on a romantic relationship? <laughs> Why do you have a smirk on your face saying that? It depends if it fits in the scheme of the story. I mean, the story telling takes such precedence in the show. To think that Mulder and Scully would be on the tail of some mystery or some alien and have to stop and discuss why Mulder doesn’t put the cap on the toothpaste – it kinda gets in the way sometimes – doesn’t really fit. It fits the way it has been and that’s as a possibility or an accent but not as meat! Chris Carter: I want to say to the audience… Beware of Agent Fowley! Beware of her? wait a second…what?! Special Agent Fowley and Scully get together. Scully’s character is increasingly drawing strength from her religious beliefs while Mulder has been more doubting of that. What are your own beliefs. My beliefs are not religious per se they’re more – and I hate using this term – spiritual than religious. It doesn’t conform to any particular religion. Without getting too philosophical…there’s not really any way to talk about it but it has nothing to do with organised religion of any kind. What Gillian just spoke about or the character? I think its interesting about Scully. She is a skeptic because she is a scientist yet she was raised with certain religious beliefs. The interesting thing about her character is that she is a scientist but her religious beliefs don’t fit with that skepticism. How do you judge whether or not to do a mythology episode or a Monster of the Week episode? You want to space the mythology episodes evenly because they are very personal episodes in the show. They tend to become the thing that everything else fits neatly within. It’s sort of rhythmic thing. I think next year you’ll see 6 of 22 Shows will be about mythology. They are fun to do. The difficulty is in making sure they can be easily understood but complex enough to be interesting …and make sure you don’t loose the audience along the way. How about for the acting does it make a difference Mythology episode or Monster of the week – stand-alone? I feel sometimes that mythology episodes take more energy and take more focus. Monster of the week episodes are opportunities to do good work but also to kind of rest a little bit and not have to keep the intense focus on all the time. How much do the 2 of you, David and Gillian add to the story line yourselves? Not so much. In the first three years I had something to do with a few of them but not years 4 and 5. Except recently, I wanted to have a fight scene…and got the opportunity to have one! I think their contributions come through character. David and Gillian have a lot to say about their characters and what they would say in a given situation and that’s how the story lines are impacted. It’s always been a pretty open line of communication both ways – story and character. Chris! The tremendous success of the X Files, is it all your Master plan – did you see this from the beginning? Oh yes … <grin> No, you can’t imagine this kind of success because TV Shows don’t have this kind of run first of all… mostly it’s a business where things come and go. That we would be doing Expos, and we would have books and 4 records now and movie – a lot of it is unprecedented so you don’t dare imagine it to be honest. <Ernst from france> Chris, do you know the ending? The ending of the show? Yes, I know vaguely where I want to go but there’s a lot of work between now and then so a lot of that will dictate how it ultimately comes to an end. For Gillian – Before the Show you were a relative ‘unknown’ to such a big star. What has fame meant to you? I was unknown to the public! – no question about it. <giggles> What has fame meant for me? I don’t know if it is ‘fame’ that has meant something more than the opportunity to be working continuously has given me the opportunity, to learn the business, how to work in front of film. Also, because of the show’s respect as a whole, it’s made an easier ground for me to at least have conversations with people that I respect in the business and that I would like to work with. shooting movies in the breaks between the show. What drives you to work so hard? I’m not working right now, I’m taking a break. I think that what drives you is a change of pace. Playing the same character five years in a row… you get a couple of months off in between seasons you want to do something else. Sometimes its interesting, but sometimes it’s rejuvenating sometimes exhausting, you gotta take the chance and try it. Question from one of our Hotmail readers. Can you still keep adding to the characters after 5 years? You add experiences to the character. The character is set. I set the character in the first year. The core of the character doesn’t change it is set, though it accumulates details and just goes through different experiences. Scully has grown amazingly over the years with some extraordinary experiences. Do you see many changes for her? Well, I don’t necessarily think it’s me taking her further. I rely and trust the writers to take her in interesting and sometimes complex directions. The writers have done that wonderfully with no input from me whatsoever. I think she is set – I settled into her character more in the third season. From that point on I feel comfortable with her. It’s just a matter of changing the details and experiences. Would either of you be interested in Directing? <nods> Yes. But if you were to talk about directing an X-File, it would mean, we’d need two weeks off to prep it, which would mean you’d need an episode and a half off as and actor and then you’d want more time for post production, which would mean more time on the back end, so it’s hard when you’re acting in a series with just two lead actors to get the time off to direct. Not an X-File…I couldn’t imagine directing David! :0) (You know what I mean by that :0)) Eventually I would be interested in it, but I’m not prepared for by any stretch of my imagination right now. I haven’t been paying attention. Guest writers are a lot of fun in this past season. Is that going to continue. Yeah, I don’t want to go out and make a run on every horror or mystery or science fiction writer in the world. But there are certain really perfect fits Stephen King was one and so was William Gibson was another. We actually worked with William Gibson for two years off and on for that story and I was just talking to him today actually and we are going to do it again next year. 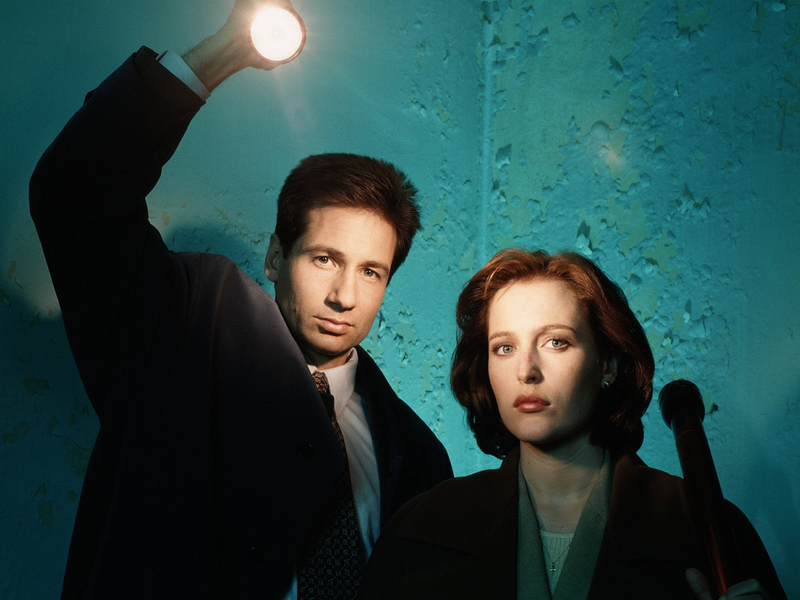 What do you think is the most important aspect of the X-Files, what do you want fans of the show to walk away with? and Q: What do you think of all the fan sites on the Internet? Do you ever visit them? I want people to be entertained and scared I want it to make it a great intense, hour of television. If they get anything beyond that – if it’s not that we set out to educate people even though the science is very accurate to the point where it’s almost speculative. What we all try to do is to make it a very entertaining show. It seems to fit very well with the nature of the series. A lot of the episodes hint at the broadening of technology and technology taking over in some way or another and the involvement of extra terrestrials and their heightened technology. It seems logical…and I’m not answering your question at all…I think it’s great! Did you have any reservations about doing the film as opposed to doing a new role or a different character? Yes. That was the sole reservation, I wanted to do this film from the first or second year when we first started talking about a film. But you have a fear as an actor of doing one role too long and this meant 5 years now I’ve done this one character with only two or three other characters in that time. Also creatively, it can be a little stifling to play the same character. Spending the vacation playing Mulder it was a concern. I actually didn’t agree at the time with Fox’s interest in doing the film during the hiatus. I thought it might be a better idea to do it when the audience no longer had the show to watch any more. But …ahm…I was wrong. I’ve seen a lot of movies this year actually… <grin> The word sequel scares me .. <laugh> They are a chance to exploit the success of the first one… I want to do another movie ! I want to do a whole series… Pre-quell doesn’t scare me at all <laugh>. This movie is actually part 4 of an 8 part serialisation like Star Wars. This is part 4 there is three pre-quels and four sequels – this is just an equal. Chris: What other science fiction writers do you enjoy? I wasn’t a science fiction fan. But I like William Gibsons books and Doug Copeland but that’s not really science fiction per se. Although, I read Ray Bradbury as a kid. David, there has been some great scenes between you and The Smoking Man over the years. Do you and Davis have a particular chemistry? No, we just play the scenes. They are usually high intensity screaming and yelling, pointing fingers, taking the cigarette out of his mouth and smashing it in his face and so on… so they’re fun! It’s chemistry of a kind…. I’d say that it’s chemistry. Once we thought he was my father it got more interesting. To DD and GA: Do you get sick of the fans. Is it a drag sometimes? You don’t get sick of the fans. You get sick of talking about yourself. You get sick of yourself and the fans can bring that out in you! How much of your own stunts do you do? You do some within reason, you do the stuff that they tell you that you can do that will look good and won’t hurt you. You don’t do the stuff that he tells you you’d be a fool to do. You trust the stunt co-ordinator or you wind up getting hurt. You can’t get hurt because you don’t have a sub. It’s like being an athlete you’ve no substitute. You kinda do ’em, cross your fingers and hope you don’t get hurt. If Mulder sprains an ankle, it has to be part of the story. I was playing squash with Chris and I tore a calf muscle. We wrote it into the story – a fall so I could be limping. I had to fake limp after it was healed. Where does the Inspiration for the shows come from? That’s a question that everyone asks and it’s impossible to answer, but the truth is that most of them come out of science so if you find some interesting science you can ask the ‘what if’ question and take it to it’s illogical or paranormal end. The wonderful thing (to chris) if you’ll allow me to speak for you, about the mythology for the characters is that after a while it begins to dictate the development of the story lines and takes you to a new area where we have to kind of fill it in. Right, at the beginning of season 5 we had this two part episode and when we came to storyboard it, the way the story worked out – for the first time, what had gone before began to dictate what should come next. It becomes inevitable, which suggests that when you make enough choices a pattern emerges and begins to assert itself. Gillian, do you plan to pursue a Musical career of any kind? No, no, no…no your taking about Black Astro Turf? – that wasn’t my intention to begin with at all. I was just doing something for fun – a one of – I did a Spoken word on a track for the band – it was just for fun. David. Do you expect any Oscar nominations? If there is it’ll be for the technical awards some excellent people came in and did some excellent work in this movie, so that’s where I’d anticipate it would go. Are you Star Wars or Star-Trek fans? I love Star Wars. I’m not familiar with Star Trek myself but my daughter actually, is a bigger Star Trek fan. Yeah, I loved Star Trek in re-runs when I was a kid Channel 11 in New York. I’m a fan of the original series I don’t watch the movies or the next generation or the present generation, just Kirk and Spock and Sulu and the boys. No, I was a fan of Star Wars and George Lucas fan. I’m not a fan Star Trek fan and I get boos and hisses when I tell people that to Star Trek fans. My big Brother was a fan and maybe that is why I wasn’t. One of the similarities with the fan base continuing after the run of the show – do you see X Files conventions a little like Star Trek 20 years down the road. To be honest I hadn’t thought about it. I think the differences in the shows are great. I don’t imagine X Files: The Next Generation or X Files Babylon 5 or it doesn’t seem like it is something that would come naturally out of the show or anything like that. It’d be more like re-runs of the Twilight Zone. They didn’t have conventions. Will you be touring Europe with the X File movie? Yes, I might go to europe in late June or early July. Uh huh no, I’m going to Mexico I got some fans down there – the Oscar people. Mulder started out trusting no-one can he trust Scully fully?. Yeah, I think Mulder has trusted Scully now for quite a while I think one of the interesting propositions we can play on now is when he distrusts Scully. So it can be more tense when he feels he can’t trust her rather than the other way. Does the show have an over all message for the fans? No, whats interesting for me over than wanting them to be entertained and see something worthwhile. I get to write about things that interests me in science and play with belief systems and dramatic devices. Overall there is no great message, no. How do you write do you have a particular writing style? Basically the same way your sitting now. Hunched over… in the dark. :0) Nah..actually, I do have an ergonimically designed chair it’s a several thousand dollar chair but I have discovered I haven’t always been using the chair for it’s purpose. I need that edge of the seat feeling, like on a Saw Horse which is not what it’s there for. Gillian Anderson: Yep. In the dark. Will Scully continue to take a more active role in the sequels is she going to be doing more fighting scenes? Do you see her rescuing Fox and so on! In the sequels Yes. Scully has rescued Mulder in the series, she is fully capable of handling herself I think it always exists as a possibility. Yeah, I enjoy the physical work. Doing some minimal stunts – I enjoy lifting up David. It’s fun! I can’t answer questions like that – favourite food, favourite musician, favourite movie, I go home at night and I kick myself after I answer questions like that – it’s all good, as Gillian said. Chris, The Black Oil – can you tell us a little more about it? I’m going to make a pitch for the X Files Album, which has a secret track on it where I give a little bit of information about it at the end of the record. So that’s a good place to learn what the black oil is so you have more sense of it so when you watch the movie you have a little more idea of the landscape that the story takes place in. It is extraterrestrial. Final Question for our readers from England. Is the movie accessible to people who haven’t ever seen the TV programme. even those who have never seen the show. About 95% of the press haven’t seen a single episode and their response was that they completely understood it and on top of that, they would now go back and watch the show. That has been on eof the nicest things about responses we’ve had from previous screenings. Even people who have never seen the show enjoyed it so much as a movie, as a piece of entertainment, completely in and of itself. Thank you very much for joining us on MSN Start and MSNBC. We have been joined online by a record 21 thousand people online and viewed on 9,000 NetShow Audio and Video streams. Let’s do it again sometime, that was cool – so cool.